All the news lately on Bill O'Reilly has focused on his chronic exaggeration of his records as a reporter on war. The short story is that while has has seen violent things here and there, he's not a war reporter, but it's not likely Fox News or their audience will care. What I don't want is to let O'Reilly and his producers/writers off the hook for this. 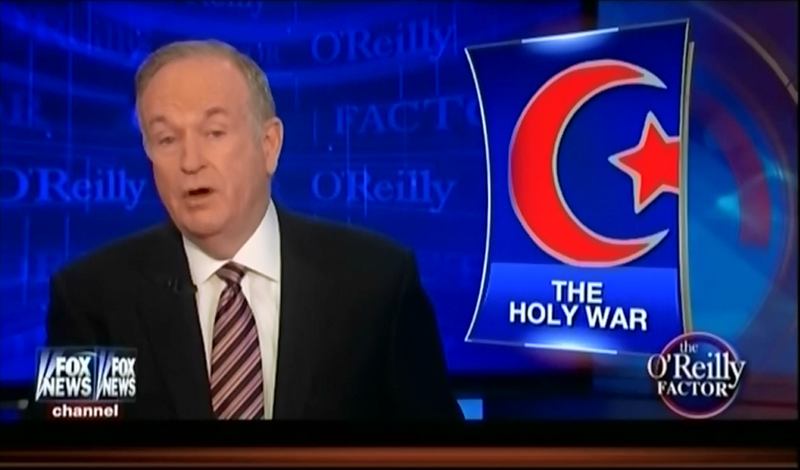 After the Graeme Wood ISIS piece came out, O'Reilly used it to declare that we are in a Holy War. Now I know something about Holy Wars, and it's always possible for one side or another to decree that they are in a sanctified battle. Things get really nasty, though, when both sides adopt such rhetoric, and that's exactly what O'Reilly did here. Fox News host Bill O'Reilly boosted his idea that the U.S. is in a holy war against the Islamic State (also known as ISIS or ISIL), demanding the Obama administration "take the holy war seriously" and urging American clerics to lead the fight. After the Islamic State's beheading of 21 Egyptian Christians in Libya, O'Reilly claimed that "the holy war is here" on the February 17 edition of his show. O'Reilly later called on "all Christians, Jews, and secularists who love their country" to call the White House and "say enough." On the February 18 edition of his show, O'Reilly again claimed it is "appropriate to define the worldwide conflict between Muslim fanatics and nearly everybody else" as a "holy war" and demanded President Obama "take the holy war seriously." O'Reilly asserted that the West must come together to eliminate the Islamic State, adding that "if the politicians won't do it, the clergy must lead the way." What's ironic is that for days before this the right-wing was insisting that Christianity was fundamentally peaceful, while Islam was fundamentally violent. And yet here he calls on clergy to lead the way. This is dangerous talk. It's going to lead to further intensification of anti-Islamic sentiment and activity among radical right-wing Christians, it's going to serve ISIS very well in their recruitment efforts, and it wouldn't surprise me if it creates more domestic violence against Muslims. I care about this much more than whether O'Reilly invented a fantasy of himself as a war correspondent. The fantasy of salvific violence is much more dangerous.